These widely popular filters are found anywhere that air is expelled from a closed system including automotive, industrial, commercial and residential settings in even common appliances such as vacuum cleaners and especially in HVAC systems. Exhaust filters are used to remove impurities from air drawn through a ventilator in a closed system. In automotive, industrial, commercial and residential settings, as well as in common appliances such as vacuum cleaners and HVAC systems, exhaust filters clean air before it is returned to normal circulation either in an enclosed space or into the atmosphere. As HVAC ventilation releases air into interior spaces, both commercial and residential, it is important that they use air cleaner filters to ensure high air quality. Often ventilation systems such as these will insert HEPA filters or ULPA filters at their exhaust site as these remove up to 99% of microscopic bacteria, diseases and allergens which pose serious health risks. Domestic uses for exhaust filters are plentiful and important; however industrial exhaust is often extremely dangerous and should not be vented back into a room or the atmosphere. Unburned hydrocarbons, carbon monoxide, oxides of nitrogen and sulfur are among the many harmful pollutants released by engines and other combustion processes. If these gases are not filtered out, they pose a serious threat to cardiovascular and lung health as well as to increased ozone depletion. Exhaust filters are an essential component of industrial air pollution or emission control systems and are often far more complex than commercial and residential filters. 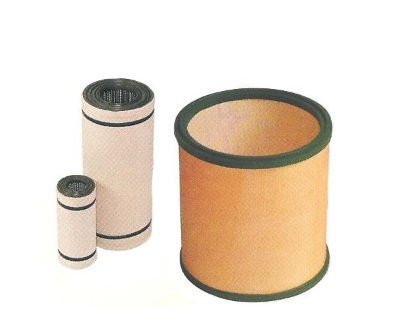 Important specifications to consider when determining a type of exhaust filter include porosity, filter size and fiber size, as well as the required efficiency of the system. The three most common varieties of household and appliance grade filters are fiberglass, electrostatic and polyester filter media pads. The basic construction of these exhaust filters is a filter panel, or a physical barrier made of spun fibers that attract and trap pollutants, which is held within a frame and placed in ductwork that an air stream is drawn through. Engine and industrial filters, however, use more complex procedures, though filter panels are often an additional pre or final means of filtration. Many of these exhaust filters use multifaceted procedures that require exhaust chambers, chemical eliminators and even incinerators to dispose of hazardous materials. Air scrubbers, thermal oxidizers and mist collectors all function as industrial exhaust filters. Mist collectors are popular as they gather expensive materials such as oil that have been atomized through the process of combustion and return them to the production process. This option not only reduces harmful emissions, but also cuts costs by diminishing procedure waste. Exhaust Filters Exhaust filters remove impurities from air that is drawn through a ventilator, thus cleaning it so it may be returned to normal circulation either in an enclosed space or into the atmosphere.